Whatever the issue Apple may have with the U.S. tax code is not an issue for us. Although trade talks take time, the ball is rolling right now and the Commission is making steady progress in the ongoing TTIP negotiations. How can Eurocrats simultaneously argue that the impact of the American tax code on the European operations of multinationals is nothing to do with them AND that the EU and USA really need to conclude a trade deal which would involve even more activities of each other's companies in the other's markets? The only way to stop today`s rebels for real is to capture or kill their leaders. Many are uniquely devious characters whose organizations would likely disappear as soon as they do. That`s what happened in Angola when the diamond-smuggling rebel leader Jonas Savimbi was shot, bringing a sudden end to one of the Cold War`s most intense conflicts. In Liberia, the moment that warlord-turned-president Charles Taylor was arrested in 2006 was the same moment that the curtain dropped on the gruesome circus of 10-year-old killers wearing Halloween masks. Now, that's not an obvious strategy against Syria's rebel groups, because there are so many of them. But that same logic for Syria points towards Damascus. Personal loyalty of regime figures to Assad is not infinite, and there's a long history of senior figures being disposed of when they got inconvenient. AP via New York Times daily roundup from Syria -- Syria activists say at least 15 civilians have been killed when suspected government helicopters dropped barrel bombs on a wake for children killed in earlier airstrikes in rebel-held Aleppo. at this point, to treat Trump’s statements as anything other than intentional is to uphold political-reporting convention at the expense of common sense. Trump has laid bare journalism’s contradictions — reporters’ desire to be critical of politicians without criticizing anything they stand for — to the point where we have no choice but to examine them. But the definition of the gaffe as an unscheduled blurting out of what the candidate actually thinks mingles two distinct types of controversy over such remarks: when they are said in public versus when they are said in private and then find their way into the public sphere, such as Mitt Romney's 47 percent discussion and episodes involving lack of awareness that a microphone is on. The entire affair, then, was being played out at the level of public opinion and, if we include the stock exchange, at the level of second-order observation. It consisted in a reaction on the part of public opinion to itself ... But how do the suspicion of manipulation, which exists anyway, and people's general mistrust of politicians' honesty take effect? It is generally assumed, after all, that there is a discrepancy between public pronouncements and actual intentions voiced only in private. Contrary to all rationalistic assumptions about the truth-bearing impact of publicity, this case shows that truth is held to reside in private, rather than in public, communication. Thus, Trump's supposed gaffes aren't actually gaffes because since they're entirely public, people don't believe them. Some of his supporters may like them being said, but that's a different story. That's why political journalists directing their efforts to being explicitly against Trump's policy stances is not going to have any effect. The effort needs to be in determining what Trump actually believes. More important, he’s used his erratic and self-evidently impromptu speaking style to support the central thrust of his campaign, which is an attack, not just on the substantive track record of the establishment, but on its discredited way of speaking — the instrumentality and the focus-grouping, the suppression of honesty and real emotion in favor of boilerplate, slipperiness and downright lies. As Hakan Altinay, former head of the Open Society Foundation in Turkey, once remarked, “the Gulenists have a Jesuit approach to education but their taste in transparency is more Opus Dei”. Apple Inc issued a patch on Thursday to fix a dangerous security hole in iPhones and iPads after researchers discovered that a prominent United Arab Emirates dissident's phone had been targeted with a previously unknown method of hacking. The attack on the dissident, Ahmed Mansoor, used a text message that invited him to click on a web link. Instead of clicking, he forwarded the message to researchers at the University of Toronto's Citizen Lab. Experts there worked with security company Lookout and determined that the link would have installed a program taking advantage of a flaw that Apple and others were not aware of ... The Citizen Lab team attributed the attack software to a private seller of monitoring systems, NSO Group, an Israeli company that makes software for governments which can secretly target a user's mobile phone and gather information from it. Such tools, known as remote exploits, cost as much as $1 million. There had to be some Israeli product that one of the Gulf states would want! Which brings up another question. Did the Iranians have help when they hacked Telegram? With the Irish media only now catching up to an angle of the Patrick Hickey situation aired on this blog last week, it might be worth postulating another angle. It seems from the e-mail traffic revealed by the Rio police today that the Olympic Council of Ireland was in some sort of dispute with British counterparts about the marketing rights to tickets in Northern Ireland. As this Wikipedia article helpfully documents, there are still unresolved formalities about which Olympic association -- Irish or British -- represents Northern Ireland. Legally it has seemed clear that representation follows jurisdiction but there's been tension when that has gotten to the point of being written down. Now the theory: was the Olympic Council of Ireland stepping on some big commercial toes with attempted marketing of tickets in Northern Ireland which the UK authorised reseller saw as a backdoor to the UK market? The UK reseller is CoSport which in turn is owned by Jet Set Sports. As a privately held company, it's not easy to figure out much about their activities, but their footprint is large (including in the USA). Access to the Irish allocation of Olympic tickets would have been especially attractive if it could also be a way to chip away at the much larger UK market. Iranian Parliament Speaker Ali Larijani announced that the country's airbase in Hamadan is still being used by the Russian fighter jets to conduct anti-terrorism flights in Syria. "The Russian fighter jets' flights from Hamadan airbase have not stopped and we and Russia are united in fighting against terrorism and this unity benefits the regional Muslims," Larijani said, addressing an open session of the parliament in Tehran on Tuesday. He, meantime, underlined that Iran has not given control of any of its bases to any world powers, and said, "The Russian fighter jets' flights to Hamadan airbase have been aimed at refueling." Secretary of Iran's Supreme National Security Council (SNSC) Ali Shamkhani announced that the Russian airplanes which flew from the Western Iranian airbase of Nojeh for anti-terrorism operations in Syria last week returned home on Thursday after ending the first phase of their mission successfully. "The Russian warplanes were not due to stay at Hamadan airbase, rather they were planned to fly from the airbase from Tuesday to Thursday (last week) and leave. The planes didn’t leave yesterday; (as a matter of fact) they left on Thursday based on the ground operations' plans," Shamkhani said in an interview with the state-run TV on Tuesday. To cut a long story short, it appears that Russia was so busy trolling western countries about its multi-faceted military operations in Syria that it forgot to check how the boasting about launching bombing raids from Iran would go down in Iran. The resulting domestic political unease about foreign bases and being used as part of geopolitical games by European powers was too much for Tehran. A newly-formed governing council in Yemen could work with Russia to "fight terrorism" by allowing Moscow use of the war-torn country's military bases, Yemen's former president said on Sunday. Ali Abdullah Saleh, a former counter-terrorism ally of the U.S. who was toppled by mass protests in 2011, told state-owned channel Russia 24 that Yemen was ready to grant Moscow access to air and naval bases. "In the fight against terrorism we reach out and offer all facilities. Our airports, our ports... We are ready to provide this to the Russian Federation," Saleh said in an interview in Sanaa. The kind of credentials that Russia now has make it appealing to discredited former presidents whose corruption and brute force response to dissent plunged their countries into chaos. Gadaffi loyalists presumably also know who to call. Apparently there's a new Syrian government talking point, conveyed via a fascinating set of tweets by Syrian tweeter EHSANI2 that if only they'd been able to move the urban civilian population out of the way, they could have managed a quick victory against the rebels with little of the collateral damage that actually occurred. There are many ways to see the problems with this argument, which has the ring of rehearsing a future legal defence about it, but one is to correct the historical amnesia embedded in it. During the Boer War, the British came up with a similar idea, that since the Boer insurgents were thriving in the local population, the way to tackle them was to move the population into camps. That became a humanitarian and public relations disaster -- even by the standards of the time; it provided a rationale for a reactionary component to the Boer identity which culminated in the apartheid state, and as an additional bonus, it allowed the Nazis to claim that they weren't the first to come up with the idea of concentrating the war zone population in camps. Other than that, it worked great. A modern version of it in Syria is no less incredible. The Syrians forced into whatever accommodation the government would have lined up for them would have been internally displaced people, not refugees, and so with no international legal rights. The Syrian government has been seizing the property of their peaceful opponents (and demolishing homes in non-combat areas) so imagine the scale of state theft with massive organized dislocations of people. And of course the Assad government would have made itself the focal point for any international aid that might have come to assist such an effort, with all the moral and financial complications that would entail. The only consolation one can take from the rising profile of this argument is that some in the government may see that the end is coming and are preparing their excuses. Could British artists sing of a highway “jammed with broken heroes on a last chance power drive” when they mean the road out of Sunderland? Noting that the United Arab Emirates is an exemplary nation in terms of its open-minded policies, Blair praised the leaders of the UAE for their strong, long-term and strategic planning; saying that the West has much to learn in this regard. He also praised the ECSSR for its role in serving decision makers and for its exemplary abilities as a think tank. One odd thing is that Blair apparently pitched his address in terms of political forces which are open to versus opposed to globalization, with Brexit presumably in the latter, yet Boris Johnson has in the past boasted about being mayor of the 8th emirate of the UAE i.e. London. Why they didn't get the 2016 concession and what actions that might have triggered is integral to the Rio authorities' case. In the fantasy land occupied by diplomatic elites, Russia said yesterday it wanted a 48 hour ceasefire for Aleppo. In the real world, two Russian ships launched cruise missiles today at Aleppo (one above) from the eastern Mediterranean, claiming (as usual) to only hit Fatah al-Sham sites and that the missiles themselves posed no threat to civilians en route. 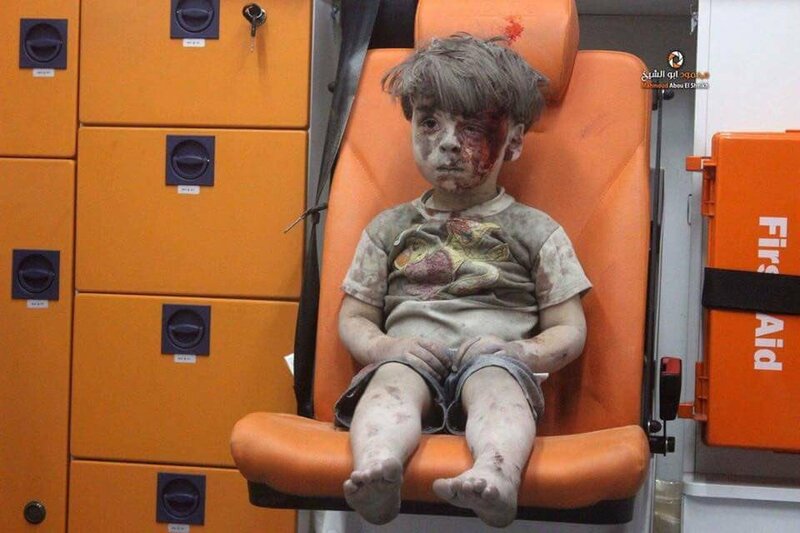 5 year old Omran Daqneesh, who was pulled from the rubble of a residential building in Aleppo bombed by Russian planes. The air strike was timed during a prayer call and the doctors who treated him and the other casualties have to use code names for the hospitals and the routes between them because the Russians bomb those too. Those would be the bombs that according to the Russians, only kill bad guys. All the focus on the potential interest of the Kremlin in a Trump administration is a nice distraction from the abysmally weak response of the Obama administration to Russian actions in Syria and Ukraine. Can bomb-dropping bring the USA and Russia together? The photo, via Russia Ministry of Defence, shows a Su-34 plane dropping fragmentation bombs on Deir ez-Zor in Syria, and according the press release, killing at least 150 bad guys and no one else, because they would have said so, right? And they wouldn't have dropped fragmentation bombs on an area with other people in the vicinity anyway, right? 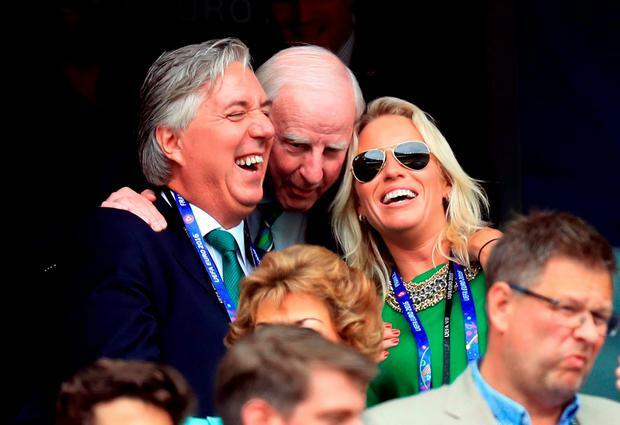 From left, Football Association of Ireland chief John Delaney, Olympic Council of Ireland President Pat Hickey, and Delaney's girlfriend, event planner Emma English at the UEFA European Championship match versus Sweden in France in June. Hickey has been arrested for ticket touting at the Olympics in Rio. 1. There still is a "Non-Aligned Movement"
4. And Sudanese President, Omar al-Bashir, under indictment by the International Criminal Court of which Venezuela is a statute member, might attend! Russia and the United States are close to starting joint military action against militants in Syria's Aleppo, Russian news agencies on Monday quoted Defence Minister Sergei Shoigu as saying. Russia used Iran as a base from which to launch air strikes against Syrian militants for the first time on Tuesday, widening its air campaign in Syria and deepening its involvement in the Middle East. In a move underscoring Moscow's increasingly close ties with Tehran, long-range Russian Tupolev-22M3 bombers and Sukhoi-34 fighter bombers used Iran's Hamadan air base to strike a range of targets in Syria. It was the first time Russia has used the territory of another nation, apart from Syria itself, to launch such strikes since the Kremlin launched a bombing campaign to support Syrian President Bashar al-Assad in September last year. It was also thought to be the first time that Iran has allowed a foreign power to use its territory for military operations since the 1979 Islamic revolution. Reports from the ground in Syria say that what appeared to be these intensified air strikes caused many civilian casualties. The Russian news release about the attack doesn't even bother noting Jabhat al-Nusra's new name (Fatah al-Sham). It's simply a joint Russian-Iranian operation to bomb "bad guys" from high altitude. Good luck, John Kerry, with that partnership. Two pieces of context needed for this post. First, Bret Stephens is a prominent opinion writer for the Wall Street Journal. He recently, ostentatiously, picked a fight with pro-Trump blatherers in general and Sean Hannity in particular, which allowed him to position himself as one of those smart conservatives horrified by Trumpism. Second, the New York Times Sunday Magazine did an issue-length feature on the Arab Spring, its precursors, immediate events, and mostly disastrous outcomes. It's a superb read (written by Scott Anderson) with accompanying superb photography (by Paolo Pellegrin). hatred of Israel is treated like sand in Arabia—a given of the landscape. [Hatred of Israel] is [not] much mentioned in the wide literature about the legacy of colonialism in the Middle East, or the oil curse, governance gap, democracy deficit, youth bulge, sectarian divide, legitimacy crisis and every other explanation for Arab decline. His opportunity to pursue what is clear a long-standing complaint comes from the Olympic judo, where Egypt's Islam El Shehaby declined to shake hands with Israel's Or Sasson. From that, Stephens pursues the thesis -- with Paul Johnson as his primary source -- that the Arab world has been in decline predominantly because its countries exiled their local Jewish populations from the 1930s onwards. A few comments on this. Not that there's ever a good time to pursue a flawed thesis, but these days are especially bad with Venezuela showing how a non-Arab resource-rich country can self-destruct due to disastrous policies, without any help from an all-consuming hatred of another. Anyway, let's go back to the first observation above, the Stephens-Hannity feud. Zach Beauchamp at Vox brings out the flimsiness of Stephens' posture as a pre-Trump sensible conservative, noting in particular his hyperbolic position on the Iran nuclear deal ("worse than Munich"). The Arab world’s problems are a problem of the Arab mind, and the name for that problem is anti-Semitism. No qualifiers on that statement: it applies to all Arabs. And in case there's any doubt, it's backed up by a later reference to the "disease of the Arab mind." For Israel, this is a pity. For the Arabs, it’s a calamity. The hater always suffers more than the object of his hatred. The Nazis suffered more than the Holocaust victims? There's great excitement among the pundit class about the New York Times revelation of hand-written journals retrieved in a Ukrainian corruption investigation and showing large cash amounts against Trump adviser Paul Manafort's name. As we've noted before, there's a need for caution in the quest for a direct line between Vladimir Putin and Donald Trump, given that any such line has to run through the very very murky world of Ukrainian politics. 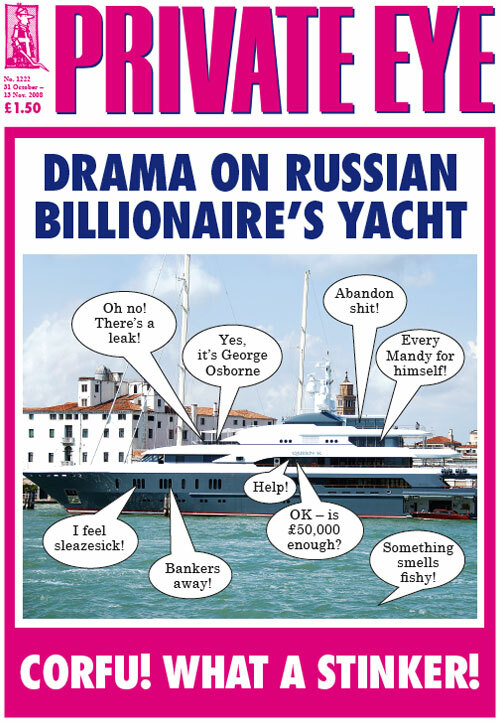 For an example of how these things can get out of hand, recall that a 2008 Tory media attempt to drum up a scandal linking Peter Mandelson and Oleg Deripaska (the latter name being all what the Manafort attention is now focused on) ultimately brought to light links between George Osborne and Deripaska. Private Eye cover, left, and a helpful Guardian roundup from the time. UPDATE: Entirely predictably, the Ukrainian lobbying money trail, drummed up because of its potential to damage Trump, now also leads to Hillary Clinton via the Podesta Group (Associated Press). When negotiating with a country, the IMF ordinarily demands conditions of its government and central bank. In its programs with Greece, Ireland, and Portugal, however, the IMF and the central bank demanded conditions of the government. They've hired every blond that doesn't work for us [Fox News]. And it's not working. From perusal of social media not to mention our own experience, it would appear that many people are still struggling to find an outlet for anger and frustration following the Leave vote. Towards that end, we're finding the cynical pessimism and allusions to chaos of 1970s-80s hard rock most helpful in resonating with the times. The following ad hoc track list is therefore suggested for your weekend listening pleasure. In the interest of linking to videos, ads may be present and it may not always be the original version, and yes, we know there's a few odd selections in there. Led Zeppelin, For Your Life. Guns n Roses, Welcome to the Jungle. The Clash, Rock the Casbah. Ireland is having a bad Olympics: a boxer sent home for doping, an official allocation of tickets ending up on the black market, and reminders of the unfair outcome of the Athens marathon when an Irish gobsh*te tackled the race leader. Someone whose name is a common thread to all these stories is Irish Olympic Council president Pat Hickey. Above, Kuwaiti officials in the wake of the seizure of 2 containers packed with 1.5 million amphetamine pills ("Captagon") which had arrived at the port from Ukraine. It's interesting how these troubled parts of the world linked up with each other! In an unusual revelation, the [UN] panel noted that Mr. Hadi, the ousted president, had appointed as governor a man identified by the American government as a Qaeda financier. The man, Nayif Salih Salim al-Qaysi, was appointed governor of Baydha Province in December 2015, the panel said. That means that the US-allied president has appointed as a regional governor a person that the US government thinks is a major operative in the potent terrorist group Al Qaeda in the Arabian Peninsula (AQAP). AQAP was among other things, looking to inspire overseas terrorist attacks before ISIS even existed in its current form. At some point the scale of the astounding breakdown in international relations during the summer of 2016 may be recognized: that after a coup attempt against a popularly elected President (Erdogan), he has been essentially shunned by European leaders until his first meeting with ... Russian President Vladimir Putin, with whom relations had crashed prior to the coup, over Syria. Maybe when foreign policy elites are back from their holliers in September they'll take stock of the situation. There's even more fun down the road when the rebel threat to the main regime strongholds grows. Maybe the Russians should dope the Syrian military to help them against the rebels. If Donald Trump is an agent of Putin, and Putin is openly meeting with Iranian President Hassan Rouhani (above, today in Azerbaijan), then is Trump really an agent of Iran? An illustration of the problem with reading too much into threads of international relations. 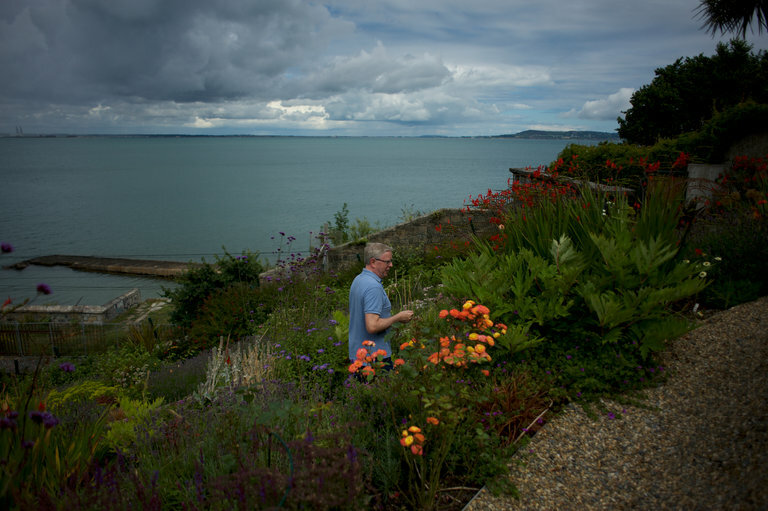 Former Irish politician and European Parliament President, Pat Cox, Charlemagne Award recipient 2004, muses at his home for the New York Times on the mystery of why other people weren't as keen on the European Union as he is. Reuters -- Turkey's failed coup and President Tayyip Erdogan's subsequent purges of state institutions are reminiscent of the Reichstag fire in Nazi Germany and its use by Hitler to amass greater power, the head of Austria's far-right Freedom Party said. ... Austria's Freedom Party (FPO) leader Heinz-Christian Strache said he saw parallels in Erdogan's use of the July 15 coup by a faction within the Turkish armed forces to crack down on his opponents in the army, civil service, academia and the media. Reuters -- The leader of Germany's liberal Free Democrats (FDP) likened Turkish President Tayyip Erdogan's purge of state institutions to the actions of the Nazi party in the 1930s in comments published on Sunday. FDP leader Christian Lindner said he saw parallels between Erdogan's behavior and aftermath of the Reichstag fire in 1933 portrayed by the Nazis as a Communist plot against the government and used by Adolf Hitler to justify massively curtailing civil liberties. 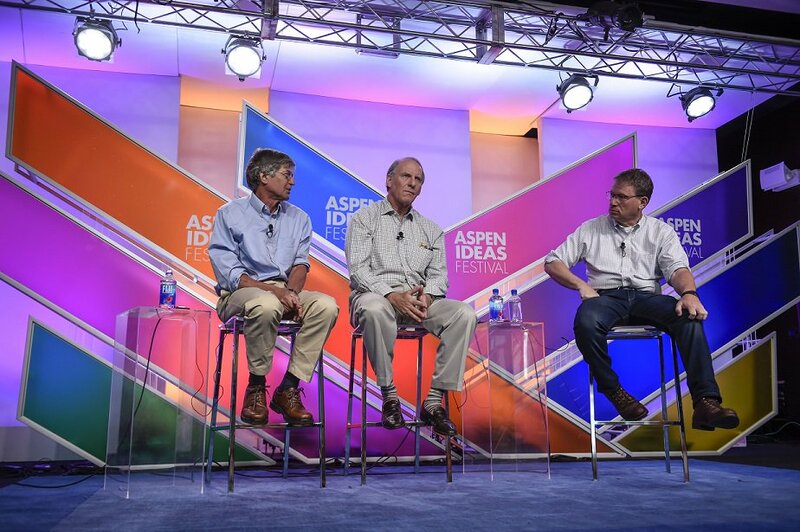 "We are experiencing a coup d'etat from above like in 1933 after the Reichstag fire. He is building an authoritarian regime tailored solely to himself," Lindner told the Bild am Sonntag. In fairness to the two cases above, they were late to the Reichstag Fire narrative, which was circulating almost immediately after the coup in other sources. The mutual incomprehension in Turkish coup perspectives -- western officials believing it was staged, Turkish officials believing it was an American plot -- should have the foreign policy alarm bills ringing. But it's August, and no one would be around to hear them. Incidentally, the first Reuters story above gives a good account of the "HS Gavur" phoney outrage. The cause of internationalism would also be helped by policies that increase economic growth, from infrastructure modernization to tax, entitlement and immigration reform. Populism and parochialism are much more likely to gain traction amid anxiety over jobs and stagnant or declining standards of living. By entitlement reform, he means cuts to Social Security and Medicare. No argument is presented for why such cuts would make Americans more outward-oriented, and it's also historically unwarranted: FDR brought in Social Security and presided over the most un-isolationist period in American history. I remember sitting in the White House looking at those generals, saying, Do you have what you need in this war? Do you have what it takes? I remember going down to the basement of the White House the day we committed our troops as last resort, looking at Tommy Franks and the generals on the ground, asking them, Do we have the right plan with the right troop level? And they looked me in the eye and said, Yes, sir, Mr. President. Of course, I listen to our generals. That's what a president does. A president sets the strategy and relies upon good military people to execute that strategy. The corporate-bond purchases aren’t nearly as welcome because they run so counter to the spirit of Brexit. Apparently, the "Spirit of Brexit," besides views on immigrants and the Irish border, also involved a nuanced position on monetary policy instruments. Less than a month ago, former Lebanese PM Saad Hariri (on the right, above) was in another of his regular audiences with Saudi King Salman (photo via Saudi Press Agency). Now his company, Saudi Oger, has become a source of apparent embarrassment to the Saudi government with India delivering food aid to its unpaid and starving expatriate employees of the company. Of course maybe the government has not been paying its own bills from Saudi Oger, contributing to the cash crunch. Last but not least, in all the programme strands the mass media do not seem to be aiming to generate a consensual construction of reality - or, if they are, to no avail. Their world contains and reproduces differences of opinion in plenty. This does not only happen when conflicts are being reported, when suspicions of manipulation come to the fore or when purely private views of reality are presented 'live'. The mass media are always also working continuously at discrediting themselves. They comment, they dispute, they correct themselves. Topics, not opinions, are decisive. There is so much talk of the 'dying of the forests' that in the end we know that we do not know what the causes are, but we do know that there are a variety of opinions about it. The truth is that Mr. Trump’s offense is in good part a creature of the campaigns Democrats have run against Republicans for decades. Sooner or later it was inevitable that voters, tired of both political correctness and playing defense, would opt for a Republican nominee who would give as ugly as he got. [BBC] -- UKIP leadership hopeful Steven Woolfe has admitted failing to disclose a drink-driving ban when seeking election as a police and crime commissioner. Mr Woolfe told Huffington Post he "forgot about the conviction" from 2002 when he stood for election in 2012 - in a possible breach of electoral law. He got a £350 fine and nine-month ban for being drunk in charge of a scooter. Mr Woolfe is awaiting UKIP's verdict on whether he can run for the leadership, having missed the nominations deadline. The 48-year old MEP and immigration spokesman, who is seen as the frontrunner to succeed outgoing leader Nigel Farage, blamed technical issues with the registration site and insisted he was still in the race.